On Tuesday, March 22, we'll explore what a shift from focusing on professional development inputs to outputs entails, and how a competency-based approach using micro-credentials can help education leaders implement these changes in their local environments. 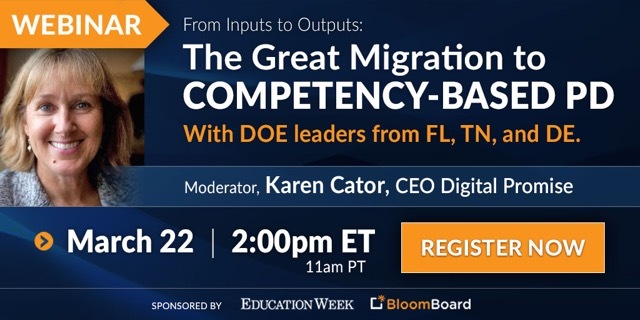 Karen Cator, CEO of Digital Promise and former Director of the Office of Educational Technology in the U.S. Department of Education, will lead a panel discussion with Assistant State Superintendents from the Florida, Tennessee, and Delaware Departments of Education. Each will discuss professional learning in their states, ideas regarding competency-based professional development using micro-credentials, and their views on the future potential impact on teacher quality and retention.